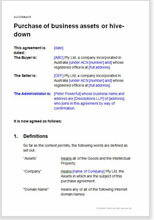 This is an agreement to buy business assets of any sort: plant, equipment, customer list, copyright, cars, stocks. It is assumed that the seller is going out of business. It is not the sale of a business as a going concern but of assets in a "break-up" situation. It is perfect for a "hive-down" situation. The seller may be a receiver, administrator, sole proprietor or the company that used to carry on the business. Whoever that is, he or it gives no warranties and accepts no "post sale risk".